CBC34123 is a Real-Time Clock (RTC) and calendar optimized for low power applications and includes a rechargeable solid state backup power source and all power management functions necessary to ensure a seamless transition from main power to backup power in the event of power loss. The integrated power management circuit ensures thousands of charge-discharge cycles from the integrated storage device – the EnerChip – and manages battery charging, discharge cutoff, power switchover, and temperature compensation to maximize the service life of the device. Data is transferred serially via a Serial Peripheral Interface (SPI-bus) with a maximum data rate of 6.25 Mbit/s. An alarm and timer function is also available providing the possibility to generate a wake-up signal on an interrupt pin. An offset register allows fine tuning of the clock. With the industry’s lowest RTC backup operating current consumption, the integrated 5µAh EnerChip provides >30 hours of backup time in the event main power is interrupted. The EnerChip has extremely low self-discharge, recharges quickly, is non-flammable, and RoHS-compliant. The EnerChip is charged automatically anytime VDD is above 2.5V. The CBC34123 is the smallest commercially available devcie that includes RTC clock/calendar functionality with integrated backup power. The CBC34123 is available in a 5mm x 5mm x 0.9mm surface mount Land Grid Array (LGA) module in a 16-QFN configuration. The CBC34123 is a 16-pin, 5 mm x 5 mm Quad Flat Nolead (QFN) package, available in tubes, trays, or tapeand-reel for use with automatic insertion equipment. EnerChip RTC lasts the life of the system so you never have to change a battery. 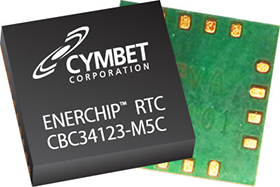 EnerChip RTC devices provide powerful single chip drop-in capabilities in the world’s smallest footprint. Wireless sensors and RFID tags and other powered, low duty cycle applications. Power bridging to provide uninterruptible RTC function during exchange of main batteries. Consumer appliances that have real-time clocks; provides switchover power from main supply to backup battery. Energy Harvesting by coupling the EnerChip with energy transducers such as solar panels.